The gentle movement of fish in any enclosure provides soothing relief from daily stresses, and with proper care, fish can live a healthy life. The standard aquarium is no longer the only option when housing fish. Plastic aquariums, ponds and even a child's pool constructed from nontoxic product, when used properly, may provide a fine habitat for your finned friends. There are advantages and disadvantages to plastic. 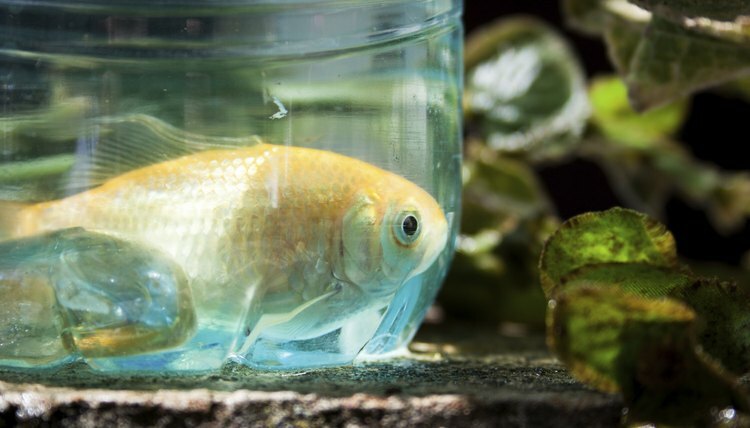 Plastic is a less expensive option when choosing a fish enclosure, but commercially available plastic tanks are typically small and meant to house a small number of goldfish or a betta. Plastic scratches more easily than glass, and can be more difficult to filter properly, given the waste distribution in only a few gallons of water. If you're choosing a plastic enclosure, be certain to visit a pet store or online retailer who specializes in fish equipment. The experts can help you choose a tank or bowl that is suitable for fish and aquarium use and strong enough to hold the number of gallons of water you intend to place inside your new aquatic habitat. In additional to being certain your container is durable enough to hold water, the type of plastic is a consideration. There are seven categories of plastics, defined by their chemical makeup and toxicity. Polyethylene terephthalate, which is also known as PETE, is No. 1 and is commonly used in aquarium products. Additionally, categories 2-4, HDPE, PVC and LDPE respectively, have been deemed safe for aquarium use, given their resistance to corrosion. The remaining three categories have not been deemed as suitable for aquarium use. An outdoor plastic pond not only creates a suitable enclosure for goldfish or koi, but it can add a lovely feature to your backyard. Fish should be housed in a plastic pond free of chemicals and pesticides; the enclosure should be large enough for fish to swim freely. According to the Utah Veterinary Medical Association, a proper equation is 1 inch of fish for each gallon of water. Plant life adds aesthetics and shade to your fish pond; consulting with a nursery provides the assurance that you're choosing fish-friendly plant life. Add a dechlorinator or water conditioner to a freshly filled pond; for best results check the plastic category number on your pond. Common plastic kiddie pools can be an alternative to plastic ponds, and may provide an indoor safe haven for summertime pond dwellers in colder climates. Hard plastic kiddie pools are typically fashioned from category 2 and category 4 plastics, two of the plastics commonly found in aquarium products. A similar technique to that of pond preparation should be used, and pools should be cleaned thoroughly and be chemical free. Garden hoses should not be used to fill ponds or pools that will house fish, as garden hoses typically contain toxins, which may leach into the water supply and harm your fish. Most fish come home from the pet store in a similar style, in a plastic bag. Fish should be removed from their temporary transport as soon as possible. Acclimate them by immersing the unopened bag into their permanent habitat for 10 minutes. Not all household plastics are safe to house fish. Many household plastics contain toxins that may create an unsafe environment; an unsafe environment can mean a far shorter life for your swimming buddies. Quality Marine; Charles J. Hanley III: Is Plastic Poisoning our Tanks?